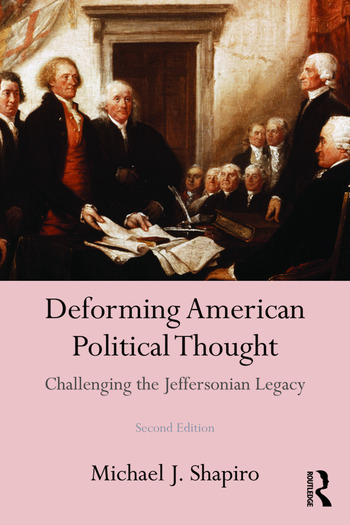 Deforming American Political Thought offers an alternative to the dominant American historical imagination, treating issues that range from the nature of Thomas Jefferson's vision of an egalitarian nation to the persistence of racial inequality. Presenting multifaceted arguments that transcend the myopic scope of traditional political discourses, Michael J. Shapiro summons disparate disciplines and genres – architecture, crime stories, novels, films, and jazz/blues music (among others) to provide approaches to the comprehension of diverse facets of American political thought from the founding to the present. The book’s various investigations disclose that there have always been dissenting voices, articulated in diverse genres of expression that cast doubt on the moral purpose and exceptionalism of the American mind. This highly anticipated updated second edition features a preface focusing on aesthetic theory and the contributions of artistic genres for political analysis, and a completely new chapter on critical thinking about the US western and urban encounters afforded by the two HBO series, Deadwood and The Wire respectively. Michael J. Shapiro is Professor of Political Science at the University of Hawai‘i at Manoa. His research and teaching interests are in the areas of political theory and philosophy, critical social theory, global politics, politics of media, politics of aesthetics, politics of culture, and indigenous politics.